Home Reception Garden Wedding Get Exciting Discounts With Ibarra’s Loyalty card! 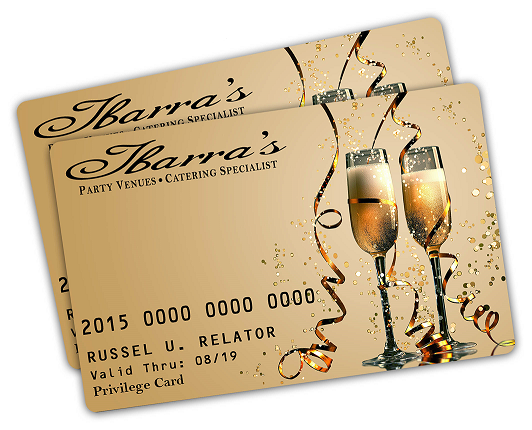 Ibarra’s Party Venues and Catering Specialist is pleased to invite its past and future clients to take advantage of its Loyalty Card. Launched in December 2014, this card can be used to get 5% discount on food and beverage. Partner establishments, whose names will be announced through the e-newsletter soon, will give exciting discounts to card holders. Previous and new clients can avail of the Loyalty Card. Just request an application from any branch of Ibarra’s Party Venues and Catering Specialist (Plaza Ibarra, Bella Ibarra, Villa Ibarra, Ibarra’s Garden, and Ibarra’s Catering) and fill it out. Submit the application form for confirmation of membership. For past clients, the account will only be activated if past transactions were worth P100, 000 (cumulative or one-time transaction). The application form is downloadable from www.ibarraspartyvenues.com.ph/news/. Interested individuals may also send an email to email mktg_manager@ibarraspartyvenues.com.ph to request for it. The application form to be submitted should be original and with signature. It should come with a copy of two (2) valid IDs. Loyalty Card for corporate clients shall be named after the company. A copy of Certificate of Registration (COR) and two (2) valid IDs of the authorized representative are required. The Loyalty Card costs P100 while the renewal fee is P100, too. Loyalty Card should be presented before registration, along with two (2) valid IDs. Discount applies to event account booking. Card holder’s family and friends can take advantage of the 5% discount, provided that the card holder is present during the reservation. This way, the event can be booked under the card holder’s account. The card cannot be used in conjunction with any of Ibarra’s existing promotions. The card is non-transferrable and will expire five (5) years from the date of validity. No discount shall be given to a member if he or she does not have the card with him or her while making the reservation. Tampering will make the card invalid. Only card holders will get discounts. These discounts have no cash value and are not assignable and divisible. They can’t be combined with any other card holder’s discounts or perks. Violation or noncompliant to Ibarra’s Loyalty Program Terms and Condition will result in cancellation of membership and forfeiture of discounts. Members may check their loyalty discount or rewards by calling our Customer Service hotline at 522.9999 or email to mktg_manager@ibarraspartyvenues.com.ph. I Like to Wed at Ibarra’s! My Favorite STUDIO NAMU Prenup!